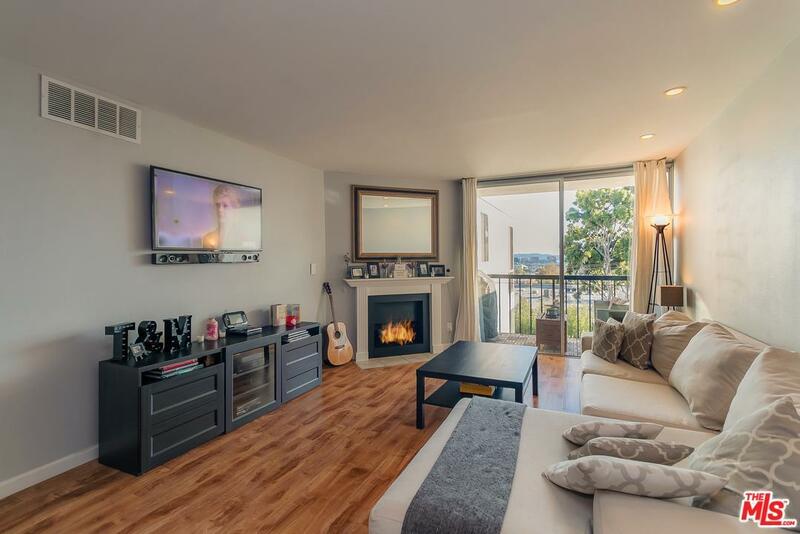 Gorgeous 1BR/1BA top floor rear condo with incredible views of the west/south side in the West Hollywood's highly desirable "Holloway Terrace" complex. Beautiful new floors, recessed lighting (including hue lights in living room), tastefully remodeled bathroom featuring new glass tile and rain shower head. Open space concept with kitchen and dining room that opens to a spacious living room with fireplace and private balcony with views. A must see! Very large master suite with two spacious closets. Nest thermostat and smoke detectors. Unit comes with 1 parking spot and a 2nd space that you can rent. The low HOA fee pays for earthquake insurance and many amenities, including a pool, spa, dry sauna, gym & rooftop sun-deck. The building also has a large rec room off the pool area with a full kitchen and billiard table that can be reserved for private parties. With a Walk Score of 91, this is truly an amazing location close to West Hollywood's popular restaurants, shops & nightlife.